GS Paperboard & Packaging's new production line will produce fluting and testliner grades with a design basis weight range of 70-180 g/m2. The design speed of the machine will be 1,200 m/min and the design daily capacity 1,445 tonnes. 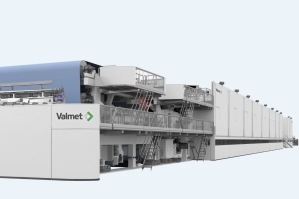 March 19, 2019 - Valmet will supply an OptiConcept M containerboard machine with automation solutions and a winder for GS Paperboard & Packaging (GSPP) in Selangor, Malaysia. The new machine, PM 3, will produce high-quality testliner and fluting grades. The start-up of PM 3 is scheduled for 2021. The value of the order will not be disclosed, but Valmet said the total value of order of this type is typically around EUR 60-70 million. Valmet's delivery will include equipment for the stock preparation system with broke and approach flow systems. The delivery for the new high-capacity containerboard machine will include an OptiConcept M containerboard machine (headbox to reel), followed by an OptiWin Drum two-drum winder with transfer rails. The delivery will also include an OptiAir Hood high humidity hood, OptiAir Recovery heat recovery with other related air and ventilation systems, a surface starch preparation system and supply system for sizer as well as Valmet Paper Machine Clothing package for start-up. The automation delivery includes Valmet DNA Automation System for process and machine controls and Valmet IQ Quality Management Solution. The 7,250-mm wide (wire) containerboard machine will produce fluting and testliner grades with a design basis weight range of 70-180 g/m2. The design speed of the machine will be 1,200 m/min and the design daily capacity 1,445 tonnes. GS Paperboard & Packaging Group Sdn., Bhd. (GSPP) is the largest containerboard and integrated paper and packaging manufacturer in Malaysia with 2 paper machines and 18 converting machines. It operates as a subsidiary of Oji Holdings Corporation.